In a 17-century palazzo, two young design studios explore a very modern material. 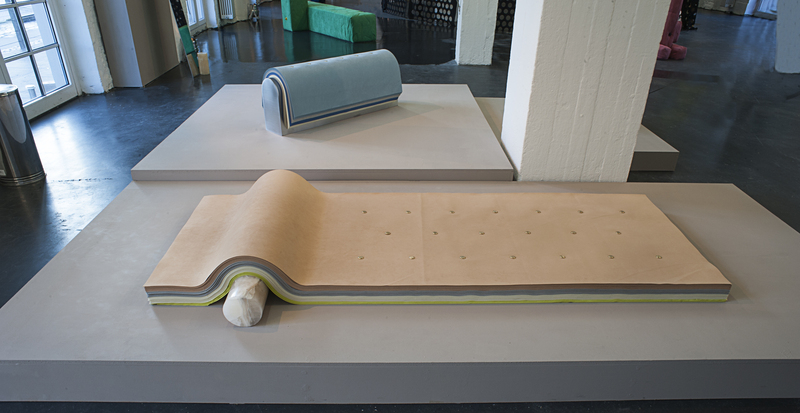 For the exhibition Touching Tales, Alcantara reached out to two emerging design studios to reinterpret their material. Andrea Trimarchi and Simone Farresin of Formafantasma chose to focus on the thinness and softness of the material, layering it and combining it with hard marble into a geological-like shape. The Amsterdamn-based Italian designers tufted the material to recall more traditional furniture forms. Anton Alvarez chose to focus on the range of colors available in with the material. His New Skids on the Block ​presented the material in sculptural configurations in vibrant hues.